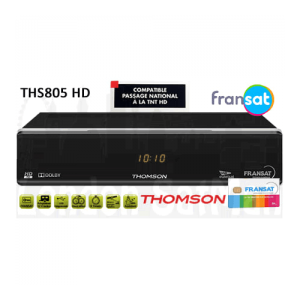 Receive the most popular French TV mainstream channels such as TF1, FRANCE 2, FRANCE 3, FRANCE 4, FRANCE 5, M6, ARTE, FRANCE O, CANAL+ (free slots only) and many others without subscription. Broadcasting from the Astra satellite 19° east, the TNT package is supplied with a 48 month, 18 channel viewing card. France 3 offers a number of regional variations, you can choose from the following. Amiens, Bescanon, Bordeaux, Caen, Clermont FD, Dijon, Grenoble, Lille, Limoges, Marseille, Montpellier, Nancy, Nantes, Nice, Orleans, Paris, Poitiers, Reims, Rennes, Rouen, Strasbourg, Toulouse and Via Stella. And best of all, the decoder is also compatible with CanalSat cards if you decide to upgrade your subscription. Extensive entertainment and great versatility Strong SRT 7404 provides exceptional pictures and sound of TNTSAT channels via Astra1 @ 19.2E. 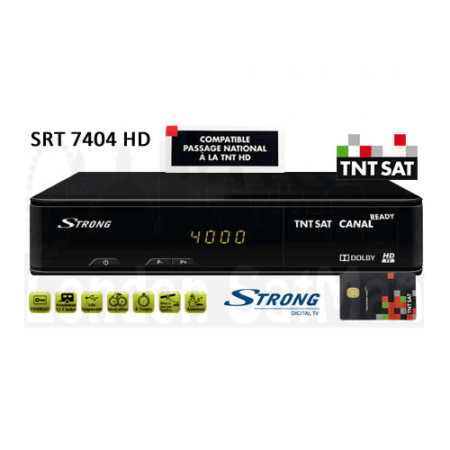 SRT 7404 is an HD receiver for TNTSAT and Free-to-Air TV and radio programmes in High Definition as well as Standard Definition. This superior receiver with smartcard reader is well equipped offering extensive entertainment and great versatility.